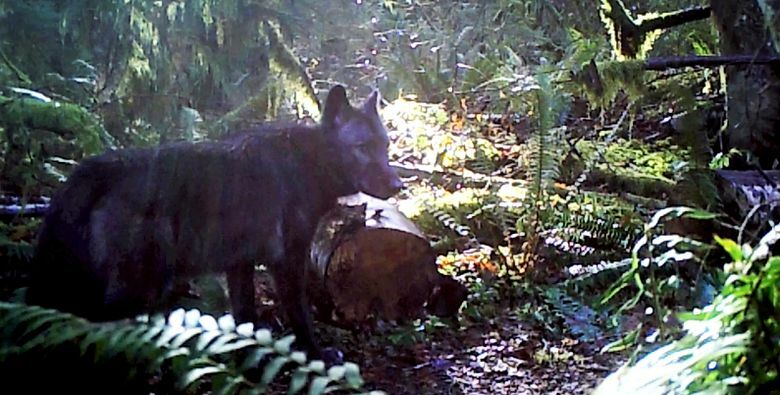 The Washington Department of Fish and Wildlife (WDFW) announced Thursday that biologists had documented a pack of the animals living in Skagit County, west of the Cascade crest. A male wolf, which had been captured in the county and given a radio collar in 2017, was joined this winter by a female wolf, according to according to wildlife officials. Biologists named the pair the Diobsud Creek Pack. The two have been spending their time near Diobsud Creek, in an area south of Baker Lake and north of Highway 20 near the town of Marblemount. That the animals are settling west of the Cascades could also mean that wolves are filling their territory in Eastern Washington. “The eastern part of the state is definitely getting to the point of saturation for the number of packs we expect to see,” Maletzke said. WDFW each year completes a wolf survey, seeking radio-collared animals with planes and helicopters to count pack members, using human trackers to find paw prints in mud or snow, and taking photos of packs with remote-game cameras. Wolves were trapped, poisoned and hunted to local extinction in Washington in the early 1900s. The canines began a rapid return to the state in 2008. Their numbers have grown from a handful to at least 126 individuals and 27 packs, according to WDFW’s latest count. Most live in rural, rugged areas of Northeast Washington. In Eastern Washington, the wolves’ re-entry has shifted the region’s ecology. For instance, mule deer have begun to change their home ranges to avoid wolves, according to a University of Washington-led study. Mule deer in wolf territory favor higher-elevation terrain that’s brushier, steeper and rockier, according to the study, which was published last month in the academic journal Oecologia. Maletzke said he did not have information on how the west-side wolves were behaving or if their behavior differed from those on the east side. Wolves’ return to the state has stirred controversy in many Eastern Washington communities, spurring hard feelings and death threats as ranchers, conservationists, scientists and politicians battle over how to handle conflicts with livestock. 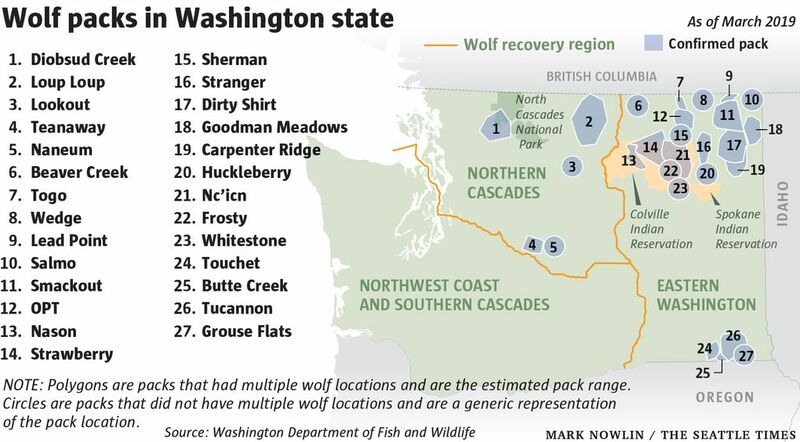 WDFW has approved the killing of members of several wolf packs in recent years. Last year, the agency killed two members of the Old Profanity Territory pack, one member of the Togo pack and one of the Smackout pack, after those packs repeatedly attempted to prey on livestock. Six wolves were legally killed by tribal hunters and two were killed by others in cases under investigation by WDFW. WDFW’s lethal orders have been the subject of legal scrutiny. Last summer, the Center for Biological Diversity and Cascadia Wildlands challenged several kill orders in court. Litigation is ongoing. Collette Adkins, the center’s carnivore conservation director, said she was glad to see a modest increase in this year’s survey of wolves, but remained critical of WDFW. Most of the conflicts have been in Ferry and Stevens counties. For wolves, “It’s our highest-density area. We have dense grazing over there” by cattle, said Kelly Susewind, WDFW director. The department will increase emphasis on promoting with ranchers “proactive,” preventive measures to keep wolves away from cattle, including range riders, guard dogs and fladry, ropes strung with flags that flap in the wind and deter wolves. 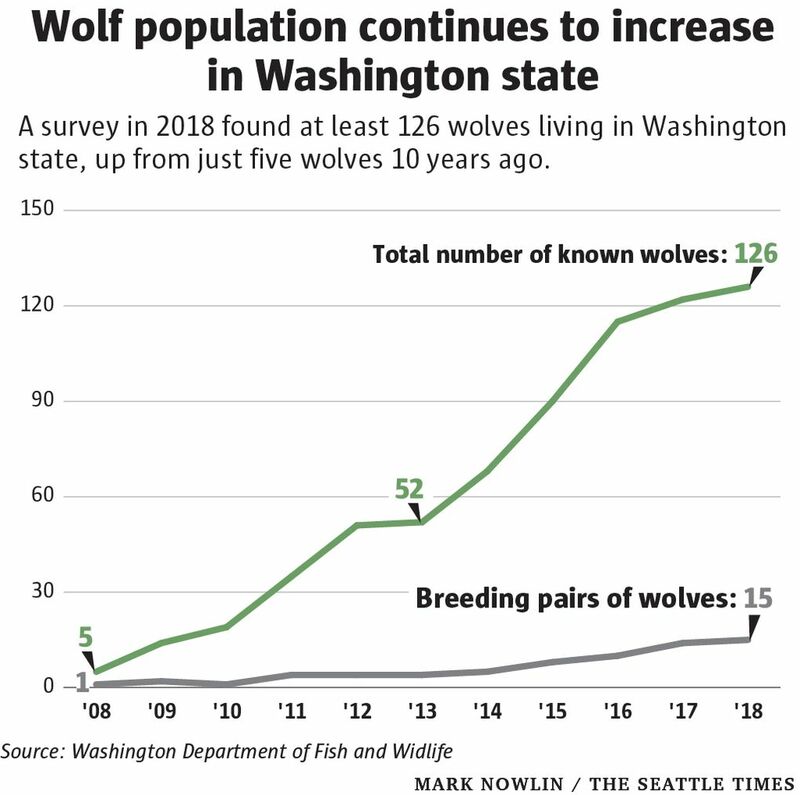 Chase Gunnell, a spokesperson for Conservation Northwest, a nonprofit with a representative on the state’s advisory group on wolf issues, said the state’s investment in nonlethal measures is paying off. As wolves spread in other Western states, like Montana, a higher percentage were killed after livestock conflicts, he said. The debate over wolf management has often boiled over in the Legislature. Rep. Joel Kretz, a Republican from Wauconda, in the state’s northeast corner, has sponsored legislation to relocate wolves to Western Washington, where they’re more popular. Recently, he sponsored a tongue-in-cheek bill to send the creatures to Bainbridge Island. Kretz might get his wish for wolves to populate the west side — without human help.